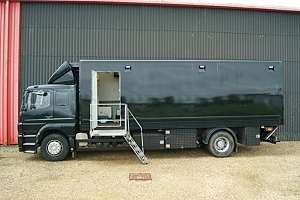 Links Broadcast in UK offers OB van for sale. Harlow, UK, September 2015: The broadcast services company, Links Broadcast, is offering for sale an Outside Broadcast van. The vehicle is a Mercedes Axor 18-tonne Tender with an on-board Fischer Panda generator and tuck-under tail lift. The registration date was June 2006.